Monday was the 121st running of the Boston Marathon. The stories from the storied day are too many to list fully. Here nevertheless are some of the big ones. Big One #1 is the resurgence of American men's running, with six of the top 10 finishers wearing the red, white and blue, and Oregonian Galen Rupp coming in second overall. Bigger One #2 is that Swiss wheelchair racers Marcel Hug and Manuela Schar both set new marathon records for men and women. 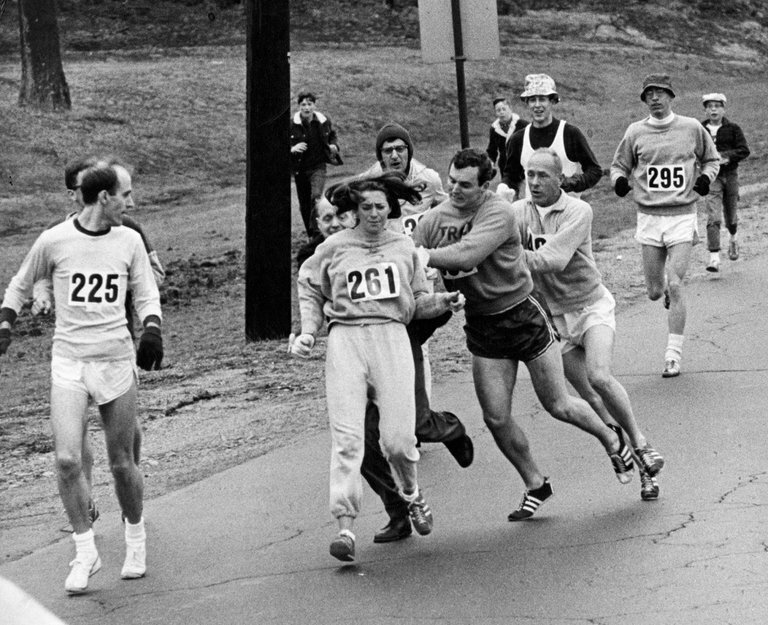 Even Bigger One #3 is Katherine Switzer's Marathon Monday in which she reran the 26.2 miles 50 years after her groundbreaking 1967 effort when she became the first female to officially enter and complete the race. 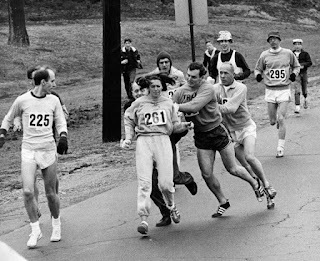 Her run produced this amazing photo in which race official Jock Semple attempted to grab her and pull her off the course. Semple was body-blocked by her boyfriend and Switzer continued on to the finish line. My biggest story, however, is just one of the many small moments when 30 plus thousand people decide to run too long and too far. It includes the guy I call Marathon Flag Man. I snapped this photo of him at Mile 21 near Boston College. It turns out, he is Jose Luis Sanchez, a retired Marine staff sergeant who lost part of his leg in 2011 in Afghanistan. 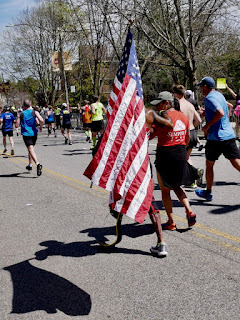 He decided to run with the American flag because in his words, "I wanted to fly the flag again in their honor, and for everyone's sacrifices."